Michigan is known for making cars, furniture, fudge and other tasty desserts from its fresh apples, blueberries, cherries and strawberries. We’re home to some of the brightest entrepreneurs in the world who are creating cutting-edge technology and crafting industrial solutions for tomorrow. We’re proud that so much is made in our state, and we’re especially proud of one intangible that we produce and stock in ample supply: Michigan memories. They’re catalogued in albums, smart phones and social networking sites. They’re photographed, written about and perused in magazines, brochures and postcards. They’re recorded and enjoyed for generations. Please refer to Circle Michigan’s media materials for ideas on how best to savor Pure Michigan moments. All media requests – Please contact the Circle Michigan office at Janet@circlemichigan.com. 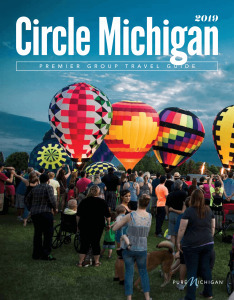 Let us know if you would like to receive our complimentary dvd on Michigan and our travel magazine, the Circle Michigan Magazine.